Upton turns out for mass rally to protest High Street toilet closure. A hundred protesters gathered in the wind and rain at a rally on Saturday 2nd September in the King's Head Yard in Upton on Severn to register their anger at the closure of the Lower High Street public toilets. The rally was organised by Cllr Mary Wilkinson and prospective Conservative Parliamentary candidate Harriett Baldwin, and it was attended by people from all political persuasions. The turnout was high as people in Upton are frustrated that their voices are not being heard by Malvern Hills District Council. A petition of almost 700 signatures has already been sent to the Council but has been ignored. Upton is a tourist destination and it is unwelcoming to have closed public loos in the centre of town. There is a public facility on the Hanley Road but it is a 400 yard walk across a busy road and it is not clearly signposted. Upton holds a range of festivals that bring many visitors into town who need facilities. The Hanley Road facility is difficult to access for the able-bodied, with small children and if you are elderly, but virtually impossible in a wheelchair. Upton has a range of excellent pubs and restaurants, but visitors are sometimes urinating in the streets and in the river. Upton welcomes visitors arriving from the River Severn and they need good public facilities. Grahem Bunn, the landlord of the King's Head, next door to the closed toilets, explained, "We get people walking through the pub all the time to use our facilities and most of them don't ask permission and don't buy anything. It has added a lot of expense for us in cleaning and in toilet paper." Harriett Baldwin said "I am glad so many people turned out for today's rally. There are people here today in wheelchairs. There are people with small children. There are elderly people and people on diuretics. Local democracy is all about listening to local taxpayers and here in Upton they are sending a clear message that they want the High Street toilets re-opened and re-opened soon." Click here for 'We've got the best loos in the land' article in Worcester News about Wychavon's public toilets. Photo: (Top) Harriett Baldwin, the Conservative Parliamentary Candidate for West Worcestershire, addresses a hundred strong crowd of protesters on Saturday afternoon, 2nd September, at King's Head Yard, Upton on Severn, in support of their petition to re-open the public toilets in Lower High Street. On her right, Councillor Mary Wilkinson, the organiser of the protest rally, and Peter Webb, the Vice Chairman of the Upton Tourist and Trade Association. 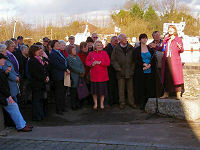 (Bottom) Harriett Baldwin, the Conservative Parliamentary Candidate for West Worcestershire, addresses a hundred strong crowd of protesters on Saturday afternoon, 2nd September, at King's Head Yard, Upton on Severn, in support of their petition to re-open the public toilets in Lower High Street.